These words summed up the sense of protest evoked in a significant number of women by the status allotted to them during the early part of the nineteenth century. Young Elizabeth Cady learned Greek and acquainted herself with law in her father’s office. Instead of winning his praise, he only lamented “Elizabeth, if only you were a boy.” Young middle-class women of the time watched their brothers depart for college while they stayed at home, lost all rights to property when they married (William Blackstone had said in his famous Commentaries, “Husband and wife are one and that one is the husband”), and, in some cases, were subjected to legally permissible physical punishment at the hands of their spouses to ensure their “obedience.” If they spoke in public, they were denounced by the churches for “promiscuous activity.” Most important, women were denied any voice in enactment of laws by which they were governed. 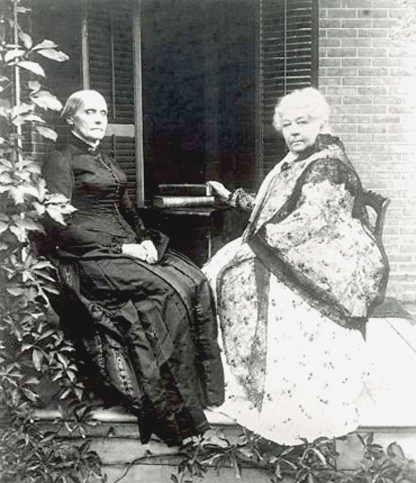 To correct all of this, Elizabeth Cady Stanton met with Lucretia Mott and Jane Hunt over teacups in Waterloo, New York, on July 13, 1848, to plan a women’s convention to be held in Seneca Falls, New York. In the colonial past when the right to vote was linked to property, some women enjoyed the franchise. The right, as applied to women, had been revoked in New York in 1777. The spread of Jacksonian democracy beginning in the 1820s had meant universal white male suffrage, without regard to property or other qualification, but sensitive, intelligent, and publicly concerned women were still deprived of it. Susan B. Anthony did not attend the Seneca Falls convention. When she learned of it, she regarded the proceedings with amusement (WHY?). She herself was a temperance worker, but when she attended a New York State temperance convention and attempted to speak, she was rebuked and told, “The ladies have been invited to listen and learn and not to speak.” She immediately formed a female temperance society and perhaps became more amenable to the feminist cause. In the spring of 1851, William Lloyd Garrison and George Thompson, an English abolitionist, conducted an anti-slavery meeting in Seneca Falls. Susan attended, staying at the home of Amelia Bloomer. They met Elizabeth Cady Stanton in company with Garrison and Thompson on the street. Immediately, Anthony and Stanton began their historic friendship. Anthony was described as the “Napoleon” of the suffragist movement. Hers was the organizational and tactical genius. She displayed her skill by appearing before every Congress between 1869 and 1906 on behalf of women’s suffrage. Stanton’s role was that of thinker and writer. She worked unremittingly for women’s movement in all its phases, including divorce reform, birth control, the challenge to religious assumptions which opposed legal rights for women. At the same time, she managed a household of seven children. Anthony often went to Stanton’s home and helped take care of these children in order to free her fellow suffragist for the intellectual work of which the latter was so capable. Nonetheless, suffragists believed that they saw a constitutional door open to them to exercise the franchise. This was in the language of the first section of the Fourteenth Amendment, which gave due process and equal protection under the law to “persons” without qualifications as to gender. Under this legal claim, some women tried to vote but were refused or their ballots were put in separate boxes and not counted. In Rochester, New York, in November 1872, Susan B. Anthony herself and her sisters succeeded in casting their votes. Acting under legal advice given by Anthony’s lawyer, Henry R. Selden, they had convinced the registrars of the propriety of their claims and had been allowed to deposit their ballots. Two weeks later, they were arrested. At her arraignment, Susan B. Anthony refused to deposit bail when set. Selden deposited it for her. But when learned that if sent to jail, she could challenge the proceeding under federal habeas corpus, she attempted belatedly to have bail canceled. The venue was transferred to Canandaigua for trial, where the judge was less open to Anthony’s claims and Selden’s arguments. He directed a verdict of guilty and imposed a fine on Anthony — although when she refused to pay, he shrewdly refrained from imprisoning her and therefore exposing his ruling to federal challenge. Anthony had emerged a heroine. An idealistic reformer, she had shown herself willing to submit to the unappealing and unfamiliar conditions of a nineteenth-century jail for the sake of her convictions. Her case had pointed up the need for a new constitutional amendment. Susan B. Anthony did not live to see the consummation of her efforts to win the right to vote for women. She died at the age of 86 in 1906. She showed her strength and optimism until the end. Her final public utterance was, “Failure is impossible.” She and Stanton had been succeeded as heads of the suffrage movement by Alice Paul and Carrie Chapman Catt. By the early twentieth century, suffragists had successfully convinced an increasing number of people that the interests of the family itself extended beyond the four walls of the home and had to be protected in public by voting wives and mothers. They claimed that women would bring a purifying influence to politics and public life. William Howard Taft had cautiously told women to collect more signatures on their petitions before he would take up their cause. Theodore Roosevelt did not include women in his ‘progressive” campaign of 1912. Neither did Woodrow Wilson in his agenda. When the latter president ran for re-election 1916 on the slogan “He kept us out of war,” suffragists retorted “He kept us out of suffrage.” Female demonstrators surrounded the White House in 1917. They were arrested on charge of obstructing traffic. When jailed, they asserted rights of political prisoners and went on a hunger strike. The vote was indeed close, only one more than the required two-thirds. One congressman left the deathbed of his suffragist wife to cast his vote and then returned to her funeral. Two congressmen came from hospitals to cast affirmative votes. Tennessee was the thirty-sixth state to ratify the amendment. On August 26, 1920, final passage was achieved. Times had changed. Adapted from a publication produced for the 95/75 Celebration by Eastman Kodak Company, K2-Design—Monica Guilian, and Millennia Communications—Catherine Samson, 1995.